Microsoft Office assessment tests are commonplace in many pre-employment screening processes. JobTestPrep has developed Microsoft Office training packs based on the same topics you will be tested on during your interview process. Start practising today & increase your chances of making it to the top of the candidates list! The Microsoft Office assessment is usually comprised of several different tests, but it most commonly involves a Microsoft Excel test accompanied by a Microsoft Word test. Typing tests are sometimes also included. These tests often come in two different levels of difficulty — basic and intermediate-advanced. Each test, regardless of its difficulty level, contains topics involving both fundamental skills as well as more sophisticated ones. What sets these tests apart is the amount of questions relating to each level of Microsoft Office skills. 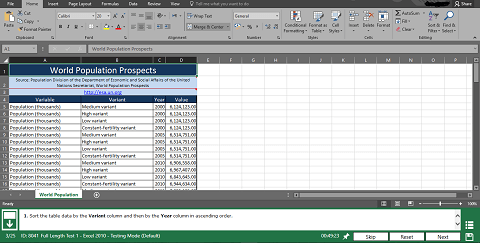 The basic test includes more questions of the fundamental skills variety, such as formatting cells in Excel or inserting a text box in Word. This test is often aimed at candidates applying for positions involving clerical or secretarial work, but it can also be used for many other jobs. The intermediate-advanced test also consists of questions on fundamental skills, but it features more questions associated with higher level skills. Such skills include creating Macros in Excel or using Smart-Art in Word. This test is often used in the screening processes for analysts, financial advisors, engineers, and more. Interactive tests are taken on a special software that simulates Microsoft Office’s different applications’ actual interfaces, thus enabling a very similar user experience. For each question, a task and relevant data will be presented to you. The task must be completed in the time limit given. Once the task is finished, a new task will be prompted (along with its relevant data) for you to complete. Unlike actually working on the Office app itself, the simulation software allows almost no room for trial and error. Any misspellings of formulas or functions (in the case of Excel) will not be accepted, nor will they be corrected by the software. These tests can be divided into two groups: regular multiple choice question tests and adaptive tests (or computerized adaptive tests, CAT). The first group is pretty much self-explanatory - a succession of multiple choice questions that are either completely test-based or are accompanied by a relevant picture or data. Questions usually appear in random order and have a time limit. Jumping between questions is often not allowed, so in order to proceed an answer must be chosen. The adaptive tests are a bit more complicated in nature but are superior in their ability to effectively measure a candidate’s abilities. Adaptive tests are constructed in the same manner as the regular multiple choice question tests, albeit with one small but significant difference - the order of the questions is not random but is based on the candidate’s ongoing performance on the test. For instance, let’s say you were given a question of easy difficulty and you answered it correctly. The next question will be of a higher difficulty level. Now, if you happen to fail to answer this question correctly, the next question will be of a similar or lower difficulty level. The test goes on until the system “senses” it has gathered enough information. As such, you will not usually come up against all of the questions available on an adaptive test, thus making it shorter in duration. Although they may seem easier, because there is always an answer to choose from, multiple choice question tests are often harder to succeed on than interactive ones. The questions on these tests usually don’t provide a candidate with a visualization of the Microsoft Office software interface, as the interactive tests do, thus requiring the candidate to know the material by heart. This demand can prove very challenging for even the most experienced users. You may be asked to take a test that is similar in nature to the interactive test but which is performed on the actual software. The benefit here is that you can take advantage of the integrated spelling correction system or the software’s help resource. Preparation is essential for success, as it will help you get acquainted with the different topics and types of questions you will face on your test. By practising, you will increase your chances of answering the different questions correctly. You will also gain the confidence to complete the test calmly and with composure. We are the only place to offer Exclusive full-length Word and Excel tests simulating real Microsoft Office assessment conditions: Hundreds of practice questions to test your knowledge on, great tutorials and detailed explanations for each question and a test-like environment for the most realistic experience possible. Q: Which tests can I practise for with JobTestPrep? A: We currently offer practice packs for Excel 2010/2013, Word 2010/2013, and Excel+Word bundle packs for the 2010 and 2013 versions. A: Yes, once you have purchased the kit, it is available for one year or a total of 100 uses (whichever comes first). Q: Can I practise Excel and Word as part of my JobTestPrep premium pack? Q: Which version of Excel/Word pack should I purchase? Practise the version you have on your computer. Though there will be some differences between the versions, the logic behind the questions will most likely remain the same.